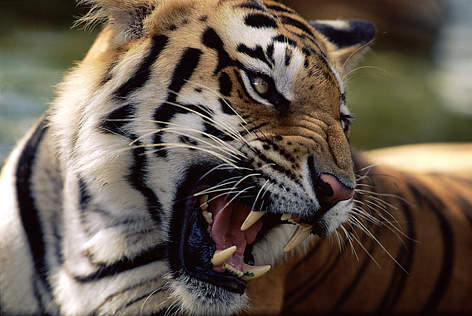 Tigers are the most charismatic and well known largest of all the Asian big cats. Tigers have narrow black, brown or gray stripes on their heads, bodies and limbs. Tigers can be differentiated easily since the pattern of stripes is unique to each individual. An adult tiger can measure nearly 3 meters from the nose to the tip of the tail, and can weigh more than 250 kg. Adult tigers are mainly solitary preying mainly on deer and wild pig. However, sometimes 2 tigers with neighbouring territories may have a friendly interaction with each other. Depending on prey abundance, their territories can range from 10–400km2 (females) and 30–1,000km2 (males). Tiger cubs follow their mother until the age of two. Even though the willingness to catch a moving prey is instinctive in tigers, a long learning process is needed to acquire the skills necessary to catch a wary and fast prey animal. Tigers are never replaced on their range until they die. Tiger populations are under threat from prey depletion, tiger poaching and habitat degradation and fragmentation. These threats arise from a variety of factors linked to local rural uses from variety of factors linked to local rural uses as well as economic development projects. Essential challenge now lies in setting appropriate priorities in responding to these threats. In Nepal, fragmentation and loss of natural habitat and poaching are the major impediment to effective conservation. Tigers are facing a serious danger of becoming extinct in the wild. There were once nine subspecies of tigers: Bengal, Siberian, Indochinese, South Chinese, Sumatran, Malayan, Caspian, Javan and Bali. Out of the nine subspecies, the last three have already been extinct and the rest are endangered. Historic tiger range ran from Turkey, Tibetan plateau, Manchuria and the Sea of Okhotsk in South and Southeast Asia. To more than double the tiger population to 6,000 individuals by the next Year of the Tiger in 2022. Since 1998, tigers have lost 40 percent of their habitat. At present they occupy only about seven percent of their former range and are confined only in South and Southeast Asia, China and the Russian Far East. They are now found in Bangladesh, Bhutan, China, Cambodia, India, Indonesia, Laos, Malaysia, Myanmar, Nepal, Russia, Thailand, Vietnam. Tigers were once distributed throughout the lowland Terai and the adjoining foothills of the country. After the collapse of the Rana regime in 1950s and the eradication of malaria during the mid-1950s, Chitwan opened to outsiders. Thousands of people can down from the mid-hills and large swathes of wildlife habitat were cleared for human settlements, agriculture and other development activities. Uncontrolled hunting of wild animals occurred until the mammalian species including tiger and rhino were nearly exterminated from the area. Swamp deer, one of tiger's major prey species, disappeared from Chitwan by early 1970s. Significant decrease in tiger population was noticed during 1960s and 1970s. In 1964, the late King Mahendra declared the southern part of Chitwan valley as Mahendra Mriga Kunj. Later in 1973, National Parks and Wildlife Conservation Act 2029 was enacted and Chitwan National Park was declared. Parallel to the establishment of CNP, the Tiger Ecology Project was initiated in the early 1970's as a joint venture of the government of Nepal , the Smithsonian Institution, and World Wildlife Fund to conduct research on the tiger and its prey species. Based on recommendation of these studies, the park boundaries were extended in 1977 to present size of 932 sq km. Furthermore as an extension to CNP, the Parsa Wildlife Reserve was gazetted in 1976 as an extension of CNP as an approach to maintain the continuity of habitats based on the ecosystem management approach. Beside these, other significant works of the period were Operation Tiger and Tiger Conservation Project. Research and Monitoring Unit has been established to monitor tigers and their prey species in TAL. Together with the loss of their habitat, tiger numbers have also been tremendously reduced. In the early 1900s, there were around 100,000 tigers throughout their range. Today, just in one century, the estimated tiger population in the wild has been declined to as few as 3,200 globally whereas in Nepal alone there are 198 tigers as per the survey conducted in the year 2013 marking an increment in the population by 63% from the last survey in 2009.